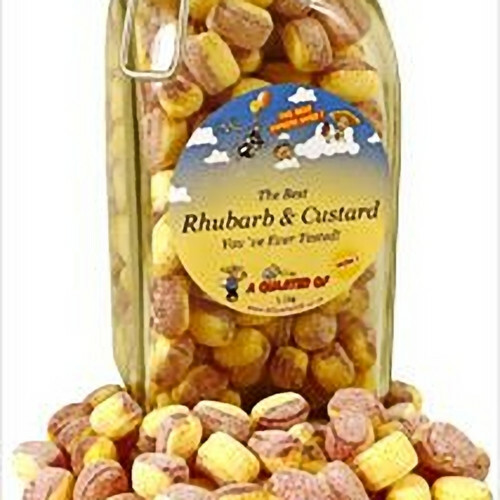 The Best Rhubarb And Custard in a Kilner Jar: Order online now! The Best Rhubarb & Custard in a Kilner Jar - A stunning (and very useful afterwards!) glass kilner jar filled to the brim with the best Rhubarb & Custards we've ever tasted. That's because we have refined the recipe over and over again, and had them made especially and exclusively for A Quarter Of. You won't find them anywhere else! Each individual Rhubarb & Custard is a work of art, and is packed full of flavour.... the rhubarb-y part of the sweet is really lovely and tart (just how rhubarb should be), and the custard part balances it out with its lovely creaminess - so we think you'll agree that the combined flavour is simply amazing (not just how you remember it... even better!). So, if you know anyone with a serious Rhubarb & Custard weakness, this is THE perfect gift for them! The product inside each kilner jar weighs 1.1kg and each jar measures 21.5cm x 10cm x 10cm (that's 8.5in x 4.0in x 4.0in). Rhubarb and Custards: The Best You've Ever Tasted!